The Finishing Touch have been busy supplying Mouldings in Melbourne to Builders and Owner/Builders. House mouldings and window mouldings are supplied as lightweight mouldings, which makes a big difference to cost at installation. Traditional concrete mouldings need three weeks of scaffolding and much more manpower than the lightweight mouldings supplied by The Finishing Touch which only require two to three days of scaffolding. In Bruarong Crescent, South Frankston three homes adjacent to each other, 12 year’s old all required replacement of the houses’ warped plastic mouldings. The three Owners decided to have the replacement of the exterior mouldings completed as one project. They received many quotes and made the decision to go with The Finishing Touch due to the construction of the mouldings, made from high grade EPS polystyrene, triple coated with a multi-part compound then reinforced with a triple coating of sand for maximum strength and durability, which will not crack, shrink, expand or bend. The new parapets and stringer moulds will refresh the homes and provide a quality finish that will last. Quoinings for a house on Nicholson Street, North Balwyn have been custom designed to fit, unlike others on the market which are “one size fits all”. This double storey has eight corners requiring quoinings. One of the biggest builders in Melbourne are using The Finishing Touch lightweight moulding technique for foam rib formwork being undertaken by Roman Precast Concrete of Dandenong. A new area of business activity is opening up for The Finishing Touch – commercial office fit-outs. ICMG are looking at using flat band wall bands manufactured by The Finishing Touch for a store at 45 Collins Place, in the CBD of Melbourne for Ermenegildo Zegna Suits, upmarket Menswear Stores. The Finishing touch are in the middle of manufacturing decorative mouldings for two Owner Builders in Melbourne. 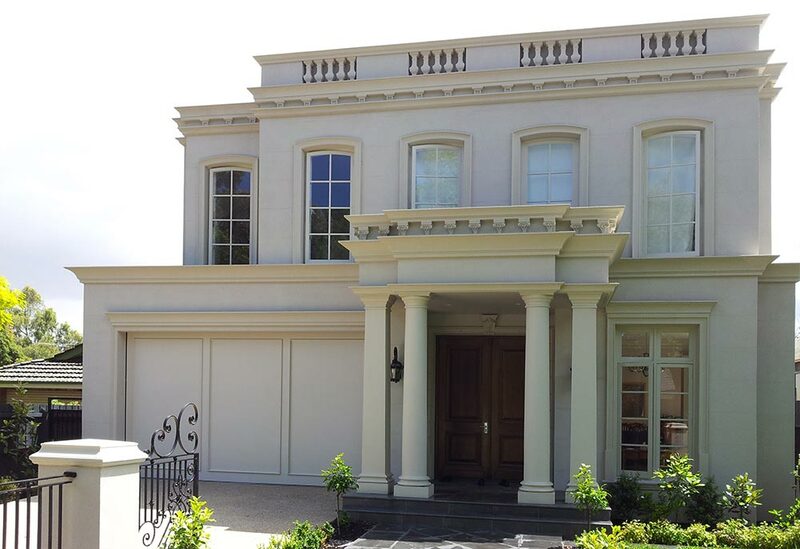 Steve from The Finishing Touch has met with both Owner Builders and consulted on the most suitable decorative architectural mouldings to achieve the style they want for their homes. These mouldings are currently being manufactured in the factory and will be completed in two weeks’ time. One of the homes is being built in Mt. Albert Road, Canterbury. The building is north facing, receiving morning and afternoon sunlight. The quoinings, parapets, window architraves and windowsills will add distinctive decorative features to the window areas, creating the much sought after French Provincial look. The other home is in Ashburton and with the addition of the Finishing Touch decorative mouldings to the windows will also present a French Provincial style. A contemporary building with a flat roof will replace the original home set upon a block in Lind Street, Strathmore. A major building group is constructing this new home, close to the old Essendon Airport and overlooking the Pascoevale valley. The Finishing Touch are providing the decorative mouldings to create a French Provincial style façade. This project represents the renewal of older housing stock in the Strathmore area, which is being rapidly modernised with house rebuilds. Tannoch Brae Aged Care Facility in St. Albans has a feature iron fence with large brick and rendered pillars. To complete the feature they called on The Finishing touch to supply decorative moulded pier caps for the pillars, creating a classic quality finish.